Goodbye Roma. Hello sleepy USA days. Right now it is 10PM and normally I would be curling up in bed or slowing down to be asleep by 11 or midnight at the latest. But instead, I am dealing with some horrible jet lag. Lets put it this way, I woke up at 5PM today. Yes, seriously. I was abruptly woken up only by my adorably squealing kitty cat, perched on my pillow, meowing endlessly in my face, fuzzy paws walking all over my face, until my eyes groggily opened ... and cat food was promptly served to my little rooster named Sochi. 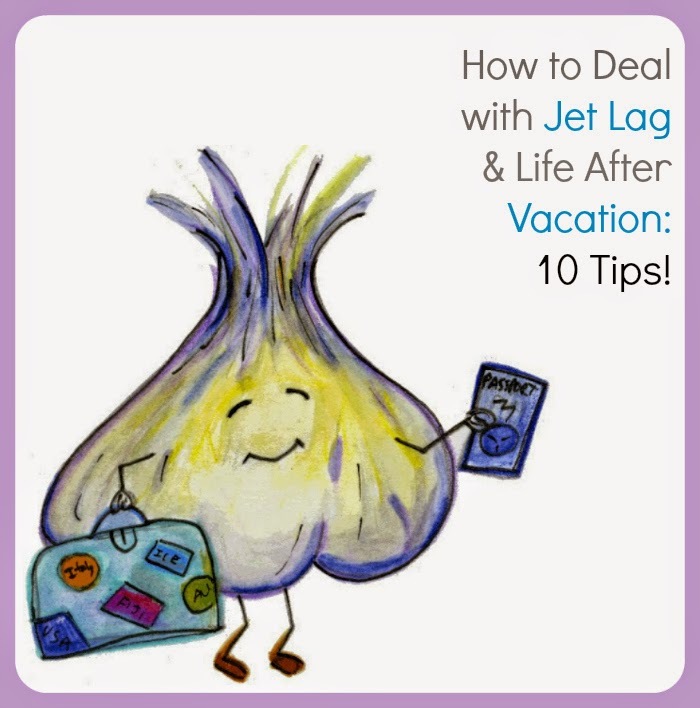 Life after vacation, whether you are experiencing jet lag or not, can be harsh. Instead of turndown service, a sprawling breakfast buffet, cappuccino on demand and fresh piles of warm towels in the bathroom, you are suddenly faced with, well, real life. Work, making meals all by yourself, zero maid service (I mean, you are the maid now) and that giddy adrenalin rush of waking each day in a hotel room is gone. Now don't get me wrong, that first night sleeping in my own bed felt really super amazing and cozy, but life after vacation is still a shock to the system. And for me, the jet lag is pure hell right now. The funny thing is, I am experiencing a weird delayed jet lag. That first day back I was fine. I was tired during the day but still went to bed on time, even though I was adjusting from a twelve hour time difference. But then on Monday morning, I was sloshed. After seven hours of sleeping normally, I just kinda never woke up! I finally woke up at 5pm, by the cat, as described above, yup, that is about 16 hours of shut eye. Normally, I would freak out, I mean this cannot be normal. Am I dying? Getting sick? Luckily, after reading a few travel articles online, this jet lag thing that I amexperiencing can be totally normal. And for someone like me who has the opportunity to sleep in, aka I work from home, it can easily be quite dramatic to re-adjust. Jet lag can mess with your circadian rhythm for a few days or even a week after you arrive home. So since I am not sleeping, I will share a few things I learned from the internet, and from my own travel/jetlag experiences. Here are my Ten Tips for dealing with Jet Lag and Life After Vacation..
1. Be Nice To Yourself. That first day back, you will likely feel like a two year-old who missed his or her afternoon nap. Cranky, groggy, hungry, foggy-brained and just plain grumpy. This is normal to varying degrees. You may even feel under the weather or like you are coming down with something. Or you may feel super depressed! Symptoms of jet lag or post-vacation blues vary greatly from person to person based on how far you travelled, where you travelled to, and (lets face it) how great your vacation was! And while I would advise anyone feeling extremely ill or yucky to check in with their doctor, I can advise this phrase to just about everyone: be nice to yourself. Allow yourself to stray from your normal schedule. Skip your workout. Eat takeout. Sleep in an extra hour. Wait a few more days to dive back into work at top speed. Do things that calm you, make you happy and give your body a boost. Maybe for some people that means getting in a workout! (Not me, sorry.) Or making a long and home-cooked meal (Yes, me!) Or going for a walk. Or bubble bath.. (Yes, me!) Or watching a movie. (Yes, me!) Just be nice to yourself and know that it will take you a few days to be back in a normal groove. 2. Eat Well. After a trip, you may be feeling a bit run down. Eat plenty of nutrient dense foods like fruits and veggies, whole grains and legumes. Do not overdo the caffeine and limit refined sugar. Aka, do not devour that take-home box of chocolates if you just returned home from Switzerland. :) You may crave caffeine and sugar and maybe even salt, but overdoing these might leave you feeling not so great in the end. But then again, if coffee is a must-have, refer to #1 and drink it, and be nice to yourself. Just try to squeeze in a few antioxidant-rich foods like oranges, bananas, kiwis, pineapple, berries and more. Try a Raspberry Ritual Vitality Smoothie. 3. Hydrate. You want to stay or get hydrated after a trip. Drink plenty of water. I also love coconut water for hydration. 5. JetLag Technology. Yup, there is an App for that. Entrain is an app designed by mathematicians at the University of Michigan and Yale University to minimize the effects of jetlag. Also, JetLag Rooster. Or you can try JetLag Rooster, a cool website that takes some basic information like origin and destination of travel, normal sleeping hours, and helps you create a jetlag plan. 6. Melatonin. This Vox article agrees that Melatonin might help your trick your body into slowing down around bedtime, even if your sleep schedule has been turned upside down. I personally love melatonin for sleeping trouble. I did not take any during my trip, though I wish I had! 7. Post-Trip Project. Instead of being sad over the loss of your vacation adventure, give yourself a photo project to look forward to. Aside from editing photos and making an album, you can even hold onto maps, ticket stubs, menus or business cards from your trip and make a scrap book. I always look forward to that when I get home from a great getaway. 8. Do Laundry. Haha, this article suggests doing laundry to get over your post-vacation blues. And while I have never been a laundry-doing lover, I know plenty of people who are, so I thought I'd include this one for you guys. 9. Bring Vaycay Home! Take a few of your most beloved vacation rituals or moments and weave them into your everyday life. I am already preparing lists of recipes I tasted on my trip that I want to make here at home. I also loved having giant plates of freshly chopped fruit each morning, grab-n-go style, so I though I might chop some fruit the night before, store it in an airtight glass dish and have it ready for me in the morning. I also loved how Italians eat big lunches! While I do not see that as an everyday tradition, I could easily see myself doing an "Italian-style Friday" by preparing a big warm pasta lunch and taking an hour break along with it. Love that laid back lifestyle. 10. Play with the Pets! The pets probably missed you a lot, so playing with those cute critters is a great way to not miss vacation as much. I know my kitties do that for me! So with that, I am going to go back to bed. Or at least try. Hope you all had lovely Thanksgiving vacation days and sleepytime tea cheers to any of you also suffering from a bit of vacation, or post-vacation blues. And stay tuned, I have some wonderful photo-rich blogposts about my trip in the works! And a recipe of course..
Heat soymilk and water in a mug. Add tea bags, maple and cinnamon. Steep for 1-2 minutes before starting to sip.